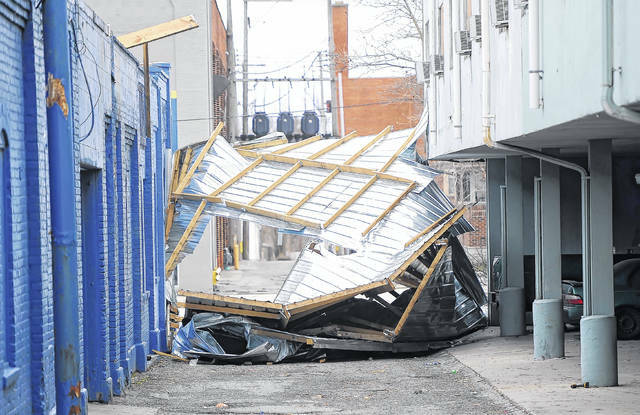 High winds took off the roof of the Royal Inn at 418 W. Market St. Wednesday morning. Part of the roof landed in the street by the motel. See more photos of the damage to the Royal Inn roof. 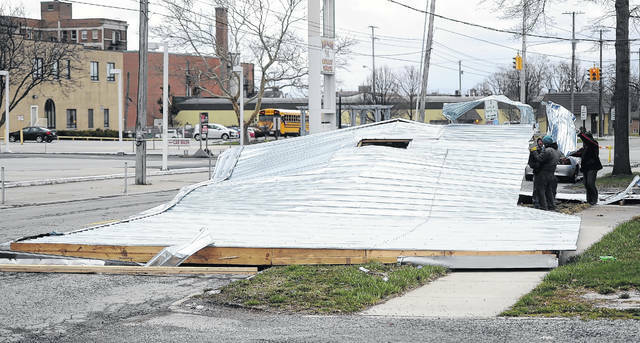 LIMA — Wind damage to the metal roof at the Royal Inn in Lima has caused City of Lima officials to order the evacuation of the downtown motel no later than Sunday, according to Public Works Director Howard Elstro. Adjudication Orders and notice of an unsafe structure were hand-delivered to the occupants of the building Thursday morning. The City of Lima has declared the motel an “unsafe structure” and have given the owner of the building, Rashmikant B. Patel, 15 days to remove all remaining portions of the metal roof and supporting framework. “They must bring the building up to code including structural, aspects of the building, HVAC, plumbing and electrical. So they have a choice of either demolishing the building or seeking out a design professional, an architect or an engineer who would be required to compose and submit plans to the building department for review and then upon approval of those plans then they could take out a permit and bring the building up to building code standards,” said Elstro. Patel apparently had not gone through the proper channels to install the roof in the first place. “An audit of our records indicates that they had made no plan submittal for that type of roof structure, which would be required,” said Amy Harpster, Chief Building Official for the City of Lima. “It was not reviewed. It was not permitted. It was not inspected. It was done without the Building Department’s knowledge. We don’t know when they did it. The neighbors had told us it occurred sometime last fall but if we had seen either equipment, like lifts or cranes around, that would have cued our inspectors to stop and ask if they had a permit. Had we seen building materials around, that would have been a cue but we did not,” Elstro noted. The loss of the roof could have hurt or killed people in the vicinity. “This is why compliance with building codes is so important. This is a very poignant example of what can happen if professional designers are not involved and the Building Department doesn’t have the chance to review building plans. This is an example of what is at risk if inspections are not made. It’s very apparent to anyone that there could have been a loss of life to pedestrians, and I think we’re just fortunate in missing that kind of a tragedy,” said Elstro. Patel has 30 days to appeal the orders to the State of Ohio. According to the Allen County Auditor’s website, the motel was built in 1964 and has had several additions over the years. It is unclear how many rooms are present and/or occupied.